BoxStation (also known as tgstation) was first made public in the year 2011 by one of the oldest coders, Noize, and several other unknown collaborators. The preceding map was the Goonstation's Devstation a.k.a. Ovary Station a.k.a. Uterus Station, which was supposedly the origin why SS13 is described as a "nonsensical metal deathtrap". In the beginning, Security was much smaller because of the Prison Wing was located in an off-station satellite (then called Prison Station) just a bit north-west of the Brig. 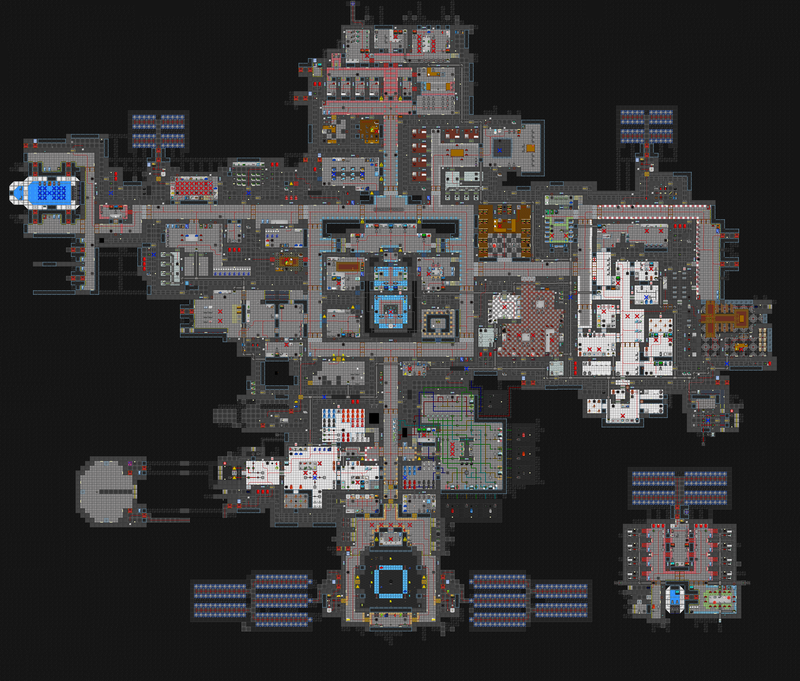 Research Division was located behind Medbay, and "Med-Sci" was the most populated sector of the station. Toxins was set ablaze almost every other round, and the way the map was made meant that the R&D Lab burned down with it. Virology used to be part of the Research Division as well, and Xenobiology held metroids. Robotics was part of the Engineering department at the time. Science, Medbay, and the Brig went through the most significant changes throughout development. Mostly access changes, and integrated mining with cargo. Mining used to be completely separate, with their own main hall access, and shared no spaces with cargo. Singularity was held indoors before. SMES Cells were moved to a seperate room while the Singularity's containment security was increased with the addition of a layer of reinforced-walls. Especially the Brig, due to the decision to merge Prison Station with the rest of the Brig. We had "Donut Brig" (above) but it was horrible as prisoners were able to circle the warden's office and evade his captors for an absurd length of time. After mappers got fed up with how Security Department occupied such a disproportionate amount of station real estate, they went and implemented a more efficient design, which you'll recognize as the one we currently (summer 2014) use. AI started out in the middle of the station, moved to Science department for a brief while before going back to the middle, then moved to an off-station AI Satellite. Debate continues as to where the AI should be held. Maintenance saw a overhaul, increasing in size and complexity. For a long time Boxstation stagnated in content, with very few people willing to dedicated themselves to improving Boxstation. Many people felt that Boxstation was due to be replaced due to this inactivity in the face of other popular stations. However from early 2013, an admin/coder called Ikarrus more or less took the leading role in BoxStation's development, updating and expanding maintenance and generally bringing the station up to code. Due to Ikarrus's development it spurred a large amount of people to suddenly start mapping for Boxstation. As of late 2014, Ikarrus stopped regular updates to Boxstation leaving Steelpoint as the primary leading map developer of Boxstation. These days it's just updated by everyone, with Wjohn occasionally handling major remaps of areas. 2010-11-15: The first version of the map, tgstation.1.3.1.dmm, is added to the code by Noize. 2011-2-7 - Chapel moved from south of Escape to north of Escape and Toxins moved from northwest of Engineering to the east side of the station, into Science Division, by Errorage. 2011-5-7 - Mail room was made part of cargo by Superxpdude. 2011-7-10 - Virology made airtight by Superxpdude. 2011-8-28 - Med-Sci (Medical-Science Department) divided into Research Division and Medbay by Superxpdude. 2011-9-18 - Washing machines added by Errorage. 2011-10-15 - Prison Station (off-station prison satellite) removed by trubblebass. 2012-1-15 - Telecommunications added by Doohl. 2012-2-12 - Public autolathe removed by Errorage. 2012-2-23 - Mint removed by Petethegoat. 2012-4-25 - Hydroponics moved northeast from bridge across hallway. Library shifted south-east from bridge across hallway. Bar and kitchen moved right of hydroponics. 7 brig cells removed, 4 remain. Security made much more compact. Various other structural changes by Ikarrus and Flazeo. 2012-11-10 - Maintenance access requirement removed from primary tool storage by Petethegoat. 2012-12-12 - Robotics moved to the starboard side, next to Science Department by Ikarrus. 2012-12-30 - HoP's Office moved from the starboard side of Bridge to the port side by Ikarrus. 2013-2-13 - Departmental Security added by Ikarrus. 2013-2-18 - Telecommunications moved from the Telecomms Satellite to the center of the station and AI was moved to the Science Department by Ikarrus. 2013-2-24 - AI moved back to the center of the station and Telecommunications moved to next to engineering by Ikarrus. 2013-11-5 - Labor Camp added by AlexanderUlanH. 2013-11-9 - Telescience added by Iamgoofball. 2014-3-21 - Gravity Generator added by Giacom. 2014-4-10 - Execution chamber re-added to brig and room for restraining prisoners added to brig by Steelpoint. 2014-4-20 - AI moved to the new AI Satellite and Gravity Generator moved to the AI's former place by Steelpoint. 2014-10-12 - Atmospherics overhauled, the atmos system is set up in a logical tree like pattern by Steelpoint. 2015-10-25 - Atmospherics is again overhauled, being moved from a tree-shaped setup to a circular setup, mostly inside of maintenance by WJohnston. This page was last modified on 27 December 2017, at 10:05.